The official blog of the world's fast and free online English dictionary. Everyday we share a "Word of the Day" on our social profile on Google Plus, Twitter, Facebook, and Tumblr as part of our objective to spread the love of learning something new. On top of that, we have some analysis at the back that tells us what are the popular words that people in general are searching for. 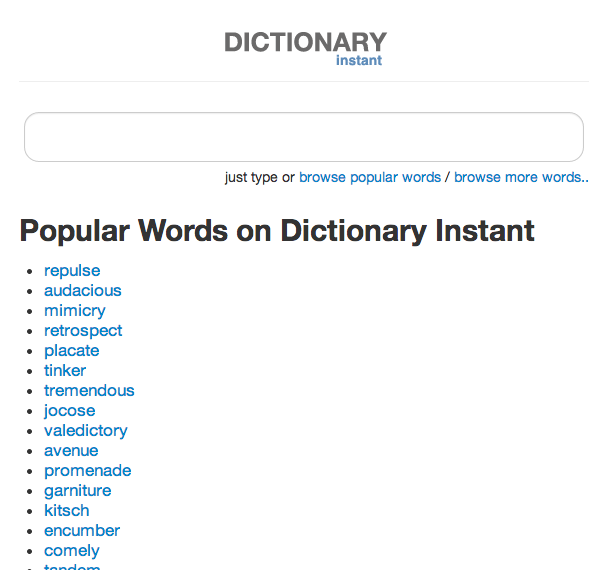 We highly encourage you to take advantage of our "Popular Words" tab at the top. If you are feeling curious or would like to pick up a new word of two, that's the section for you. We are really excited to start a blog for Dictionary Instant as we share with you some cool interesting stuff on the Internet. As you know, today there are over billions of people who go to the web to learn something new. If you've read about our objective, we hope to do just that and be able to help everybody learn something new everyday! 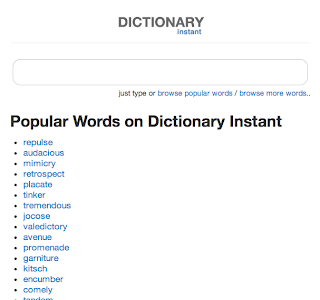 Dictionary Instant comes alive through the fact that we want to make dictionary searching fast and better for you. We have quite a following some of our social media pages as we share interesting quotes and insights that brightens your day. We look forward to telling sharing a bunch of cool stuff here with you guys! While you're at it, be sure to try out our dictionary!